It is my experience in my journey of faith that God always gives back way more than I think I am giving Him. Sign up to go help people halfway around the world who have so little and find out how poor your land of plenty really is…and how much you can learn from people who have nothing and give everything. Volunteer and give up a week of your summer to serve in Vacation Bible School so the neighborhood kids can learn about Jesus and as you sit and listen to the teachings, you find truth nuggets for your child-size brain. Load up your car with stuff you had trouble parting with and find yourself knocked to your knees by the sweet lady with scars on her face who helps you unload it all and thanks you so much and do you want a receipt for taxes…no thank you…this one is going unrecorded. So last night we drug ourselves off the couch and out from under blankets to answer the call for prayer from our pastors and leaders. We drove on slick roads and navigated the parking lot, cautioning each other to be careful because we have heard the horror stories of people who weren’t and we don’t want to add that to our deductible this winter. And as we approached the doors of the prayer meeting, we were told to select a rock from a basket. I did what I always cringe doing…I made a quip about it…perhaps involving a reference to stoning people…and found out that I was one of many who had said the same thing. Dang I hate being a cliche sometimes. We found some seats and gathered with others who just can’t resist when they open the doors of our church for any kind of service…and the prayers and praise commenced. Just like He always does when two or more gather. It was old school church with a guitar and one person leading songs and I kind of loved it. We were led through various prayers, and for whatever reason I never put my rock down. I held it all the way through the whole event. To be honest, it felt comfortable in my hand and I often found myself just holding it to my heart. I guess since our sermon that morning had referenced 1 Samuel 7: 10-12, I was still associating the “Ebenezer…thus far” reference. But then one of our leaders took her turn in the service. Turns out the rocks were meant to remind us not of how far God has brought us, but how much we weigh our own selves down at times. Our sin and the sins of others against us. Oh, I get it about my sin. I carry it like a chain at times. And not like a martyr. Like a woman who has underestimated the power of her God and overestimated the stain of her sin. But as she led us through the prayer exercise, and she talked about the weight of the sins we have had against us…the hurt and the pain…and the way it has distorted us…hardened us…wounded us…that rock in my hand started getting pretty heavy. I thought back over the previous portions of the service and how at times I had held it to my heart as I participated in worship. I remembered how I had to hold on to it with one hand which only allowed me the freedom to raise the empty one in a kind of affirmation. It had limited me from full on, both hands and arms raised in surrender praise. As she reminded us to forgive as Christ has forgiven us, I had to recognize that while I have forgiven the ones who this tangible weight in my hand represented…I still carry the pain of it because, in truth, I don’t know what to do with it. It has changed and colored both our past, our present and our future. I don’t know what to do with the memories that now look different because of other’s choices. It has stolen my joy many times and it has clouded and crowded out my joy for others who are experiencing what I would love to have. It permeates so much more than I could have imagined and even as life goes on, I am left at times grappling to just stay afloat amidst the changes brought on by a fallen world and my own fallen nature that continues to rise up unbidden, even as I know and believe and declare that in Christ I am a new creation. 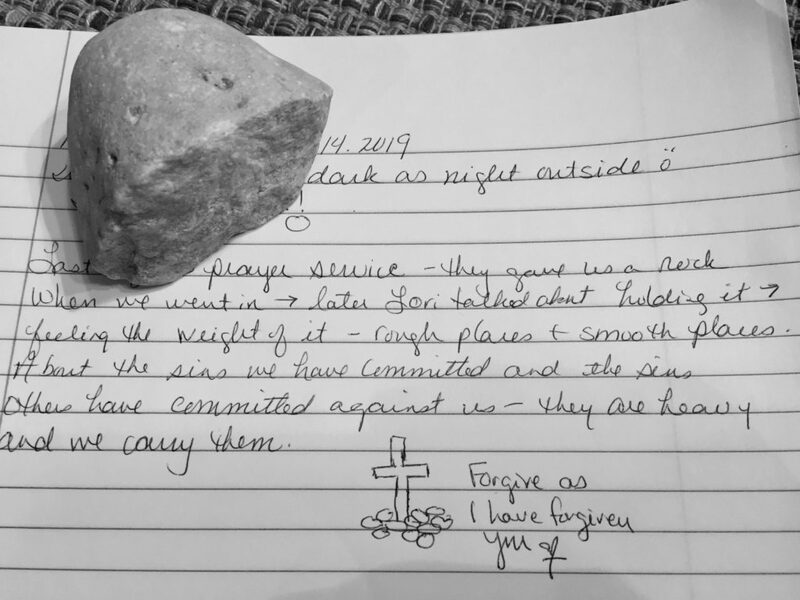 As we finished the exercise, we were given instruction to ask God to forgive us the weight of our sin and to ask Him for His help and assistance to forgive…let go…release…the pain and hurt of the sins against us. The service had come to an end and we were invited to share in one more song of worship and praise. We were invited to sit or stand. Whatever posture seemed to express our heart to God for what He had done and our hope for what He will yet do. In the fellowship of believers, sitting there with people I have known and shared so much of this faith journey with for so many years, I stood…still hanging on to that rock that fit so comfortably in my fist. And as we sang, I realized that somewhere along the way the pain has become such a part of me that I just assumed I had to hold on to it. I set the rock down on the pew and raised both my arms. I will have a choice to make in the days ahead when a photograph or a comment from someone triggers the feel of the weight of it once again, for most assuredly that temptation will always be there. I will have to choose if I will draw it close to my chest and hold on to it or lay it down. I pray I will remember His faithfulness. The stone I laid down will be a reminder of the Rock I lean on. Ah, another great reminder of how easy it is to carry all the weight of our sins, when God is waiting for us to just put the darn rock down. I have been using that phrase since I read your comment…”Put the darn rock down, Laura”…love it! Oh, Laura, as I have studied this week of God as my refuge, this writing has certainly spoken to many of the temptations I have had to hold on to my rock. What a blessed Savior we have. Thus far the LORD has helped me! Thank you for your insight!